If you listen to the Bush Ministry of Disinformation, Rush Limbaugh, Sean Hannity, Bill O'Reilly -- and millions of Americans do, every day -- you get the impression people opposed to Bush's plan for endless war are Marxist nutbars and shrill hate-America malcontents. Sure, some of them are Marxists. But most of them are normal people. In fact, some of them are even former CIA consultants. Johnson thought antiwar demonstrators during the Vietnam were naive. He voted for Ronald Reagan. In retrospect, Johnson told John Wilkens of the San Diego Union-Tribune, he was "a spear carrier for the empire." "If you have a little money, I'd prepare your escape route," Johnson says. "You might want to go up to Vancouver and buy yourself a condo." I thought about this last year. In fact, I was looking at Vancouver. But I don't have the money for a condo and, besides, I think America is worth sticking around and fighting for. But the way things are going it may be a lost battle. Chalmers makes it sound bleak. 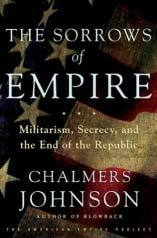 "I fear that we will lose our country," Johnson writes in his latest book, The Sorrows of Empire: Militarism, Secrecy, and the End of the Republic. Bush and the Pentagon are bankrupting the nation, dismantling the Constitution, and leading us down the path to endless war. America is afflicted with the same "economic sclerosis of the former USSR," Chalmers explains in a ZNet interview. But at least Mikhail Gorbachev tried to reform the Soviet Union before it imploded. No such luck with Bush and the neocons. "The United States is not even trying to reform, but it is certain that vested interests here would be as great or greater an obstacle. It is nowhere written that the United States, in its guise as an empire dominating the world, must go on forever. The blowback from the second half of the twentieth century has only just begun." It's not a good sign when former Generals begin casually speculating on the demise of the Constitution and the imposition of martial law, as Tommy Franks did a while ago. "I fear that [after 9/11] we are going to get even more militarism," Johnson told Jeff Shaw of In These Times magazine. "That is, more and more functions -- including domestic police functions -- will be transferred from civilian institutions to the military, and the military will have ever greater authority in our society. We know how that will end. We're talking here about imperial overstretch, and the weaknesses of the imperial structure that will ultimately lead to a collapse... If this attack is an attack on our foreign policy, as I believe it is, we should be looking much harder at what our foreign policy is. If the United States is now going to go out and bomb some innocent people in Afghanistan who have already gone through two decades of living hell -- most of it sponsored by our government and that of the other erstwhile superpower, the former Soviet Union. Then you must say, we deserve what we're going to get." Since there is no way to fight against the enormous military power and technology of the United States, adversaries will increasingly resort to asymmetric warfare, what Bush and the neocons call terrorism. Realizing they have no choice, Iran and North Korea are attempting to build nukes. It may be the only way they can prevent the United States from invading. Or it may give the US an excuse to bomb those countries in "preemptive" fashion, as the neocons like to call it. Sooner or later somebody will light the Big Candle -- and that will be the end of life as we know it. "The only hope for the planet is the isolation and neutralization of the United States by the international community," Chalmers explains. "Policies to do so are underway in every democratic country on earth in quiet, unobtrusive ways. If the United States is not checkmated and nuclear war ensues, civilization as we know it will disappear and the United States will go into the history books along with the Huns and the Nazis as a scourge of human life itself." Johnson explained the "sorrows" mentioned in his latest book in an interview with Steve Dalforno of Z magazine last November. "I think four sorrows inevitably accompany our current path. First is endless war... As it stands right now, since 9/11, Articles 4 and 6 of the Bill of Rights are dead letters. They are over... Second, imperial overstretch... The third thing is a tremendous rise in lying and deceit... The difficulty to believe anything that the government says any longer because they are now systematically lying to us on almost every issue. The fourth is bankruptcy. Attempting to dominate the world militarily is a very expensive proposition... The United States, for the last 15 years, has had trade deficits running at 5 percent every year. We are on the edge. If the rest of the world decides not to cooperate with us or just the rich people of East Asia decide the Euro is a better currency to put their money in than the dollar, we become a junkyard almost at once. The stock exchange would collapse and we would have a howling recession. All four of those things are likely to prevail... [The United States suffers from an] inability to reform. I think it is quite easy to imagine the defeat of George Bush as president. I do not find it easy at all that any successor to George Bush would make any difference... That leads me to the conclusion that we are probably going to reap what we have sown. That is blowback." John Kerry or Howard Dean or whatever vanilla flavor of Republican Lite the Democrats throw out there will not make a lick of difference. Don't waste your time voting for them. Boycott the elections. Go in the street on March 20th. Make a stink. Bang pots like the poor outside the Miraflores presidential palace in Caracas, Venezuela, when the CIA attempted to overthrow Hugo Chavez. Let them know you're pissed. Or buy a condo in Canada. And hope the wind is blowing in the right direction on the day Bush launches the nukes. Kurt Nimmo is a photographer, multimedia artist and writer living in New Mexico. He is author of Another Day in the Empire: Life in Neoconservative America (Dandelion Books, 2003). To see his photo work and read more of his essays, visit his excellent “Another Day in the Empire” weblog. * Criticizing Zionism: Naked Anti-Semitism? * UN Bombing: Terrorism or National Liberation?